Opening in 2015, we were Brighton’s first Neapolitan pizza restaurant, we have since expanded our menu to include other favourites, such as our fresh pasta- made in our open kitchen daily, and a selection of small plates and salads. Hailing from Napoli, armed with a family tradition of running restaurants with a crew of Neapolitan chefs, the team behind Nuposto truly aim to give Brighton a taste of home, embracing the classic style of Italian cooking, while embracing a modern twist. 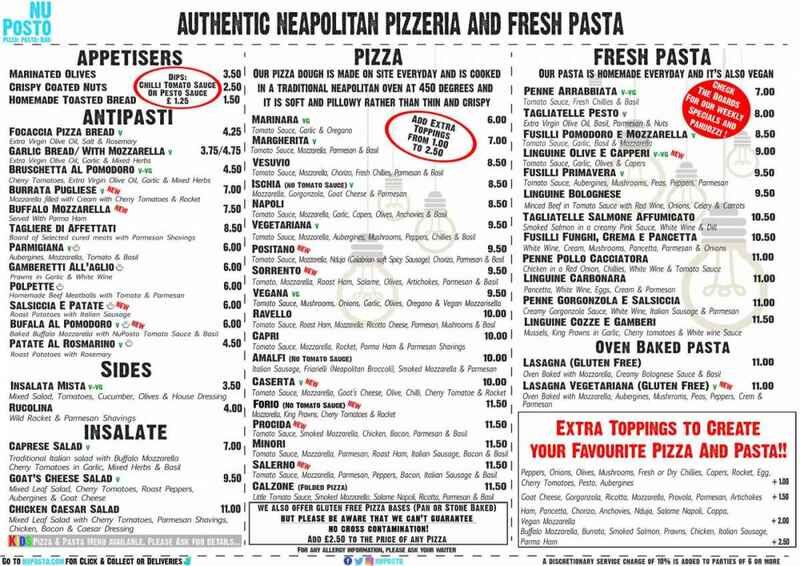 The Neapolitan pizza has now been given UNESCO Heritage Status, which shows that we Italians mean business when it comes to our beloved cuisine. We follow suit with the now safeguarded method and make and mature our dough in store. The pizza is then cooked at 450° in our imported pizza oven. The result is a perfectly puffy cornicon (crust), a little leoparding (the spotty parts on the crust) and a lovely soft centre. We couldn’t be more proud of our pasta. We make it fresh in store every day using semolina flour and water. Omitting the use of eggs also means that its slightly softer than the al dente style of pasta, but means that its completely vegan. We also offer Gluten Free alternatives. Please see the menu of ask in store for any allergy advice. The first thing you may notice when you visit us at Nuposto may be our two giant pizza ovens. These were shipped to us all the way from Neapoli, or it cold be our spray-painted walls, courtesy of Brighton’s resident graffiti artist- Aroe. Our dining area offers a range of seating, from cosy benches, for intimate dinners, to family and party sized seating, you can even unwind in our bar with a pint of Peroni or our house fizz and watch the chefs at work in our open kitchen. Planning a pizza party? Having a hen do? Let us celebrate with you! We are also great at planning for the unplanned and can usually accommodate last minute large party bookings. At NuPosto we want to fuel the hard-working students and thank the amazing NHS, that’s why we give 10% off the main course to anyone with and NUS or NHS card. Forget sneaking in a backpack full of contraband into the movies, let us feed you first with 10% off main courses for all same day Odeon Cinema ticket holders. What’s better than a trip to the UKs favourite seaside town? Brighton’s favourite Neapolitan restaurant a stone throw from where you are staying! Drop by and let us welcome you to town with 10% off your main course. We believe that food is the heart of community, that’s why we offer discount to our hard-working neighbours. If you are a neighbouring business and you want to become friends, drop in and we will see what we can do for you! © 2019 NuPosto. All rights reserved.